You manufacture your own product, whether in your own plant or through specialized sub-contractors who make up your extended company. Defining products is not a simple task. You need support that guarantees all modifications. Each new development, each innovation in your range of products should be taken into account in a controlled manner in production and delivery. For you, this means achieving the maximum amount of integration between your management system and your cutting machines, knowing at all times the event that is occurring, has occurred and will occur. You need to incorporate automation mechanisms that reduce losses and improve the efficiency of your production and inventory system. You need to incorporate customization into your products that simplify and facilitate their definition and translate to production with the best guarantees. You need to know both the stock of raw materials, semi-finished product and product ready to be shipped and their economic value. You require a reliable tracking system that allows you to analyze points of improvement and respond suitably to your clients´ demands for quality. You want to optimize your provisioning processes so that you can ensure you get the right offer at the right time, making it possible to evaluate and confirm that suppliers are responding better to your expectations and requirements. Lantek covers the entire execution of your products (manufacturing, construction, assembly, acquisition of materials and components, sale and delivery). Lantek responds efficiently to any need you may have for obtaining information, information you may need to make the proper decision in each situation. "Discover the functional characteristics of our solution for your company." 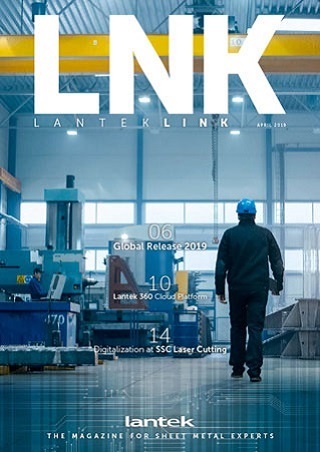 Thanks to the capabilities of its software platform, Lantek allows you to manage efficiently from the acquisition of materials to the issuance of the finished products, generate the most ideal CNC for each of your metal cutting machines for the total administration of your company, and obtain absolute control and visibility over your status at any time. Control the life cycle of your products by defining versions. Assign the development phase in which you develop each product you manufacture (Design, Manufacturing, Transportation/Packaging, Point of Sale, Post-Sale, Rejection, Recycling, Obsoleteness, etc.). Establish parameters for your product that allow you to simplify your definition, considering all possible variants. Manage your product suitably, creating organic structures that help you organize their manufacturing. Lantek offers you the necessary functionality to have complete control over your needs, to have predictions of consumption and purchases, to generate requests for material when faced with stock breakages, to plan and control sub-contracting for components to specialized suppliers or temporary overflow of capacity. In summary, Lantek synchronizes the acquisition of raw materials and components with the rhythm of the operational production and planning of your company. Control the status, location and amount of raw materials and semi-finished or finished products, even those located outside of the company, such as with sub-contractors or suppliers, knowing the value of your stock at all times. Thanks to the processing capacity of Lantek software and its advanced algorithm, you can calculate the most optimal nesting for each technology, making use of the material without neglecting the quality and finishing of your pieces. Furthermore, you can make use of CNC adapted to the various machines and technologies that you have at your disposal, which are optimized for preserving the life of the machinery and its tools. This also optimizes energy consumption and shortens operating times. Lantek faces any machine and any scenario and integrates all auxiliary elements that you already have (palletizers, robotic arms, etc.). Visualize and control, in an extraordinarily precise manner, the status of the product´s process and its components. Establish quality control that is as comprehensive as you may require. Control failures, define the key quality indicators for each resource (machines, employees, lines, cells), and establish the appropriate tracking system for your characteristics and needs. Whether your manufacturing method is built to order or build to stock, you will be able to optimize your production runs and have complete control over the production including entry of jobs, management of jobs in a queue, change management, etc. Establish the job execution control state in the operator´s post, validating the same on-site and controlling quality and failures. Establish comprehensive control for orders to your markets, using tracking and quality controls if you need them. Identify and control all rejections. Establish parameters for measuring causes and defect which allows you to extract proposals for improving your production processes. Handle all available data from potential and existing customers, plan and control commercial actions. Prepare your budgets and customer frame precisely, using Lantek specialized set of tools. Control your commercial risk defining limits per customer and detecting when credit limit is exceeded. Manage every sales order status and have every document in place: order, delivery note, quote, or any other document you already use. "Find out about the various pieces that make up our solution." Lantek has several software products that incorporate into the work platform any CAD generated formats for nesting files, whether provided by clients or exported from external systems. Import files such as XML, DSTV, DXF, etc. Find out how to program the CNC of the most advanced cutting and punching machines in the world. Lantek links with your machine to provide operations with the highest performance possible and with full situational control at all times from the operator´s post. The rest of the company knows what has occurred, what is occurring and what will occur at all times in a precise and clear manner in real time. Take control of your production with our MES manufacturing management software, which allows you to make the appropriate decisions and to direct your production like the most developed companies do. Lantek has the capacity to put the production of your plant into automatic mode, configuring manufacturing cells or automating your entire plant. You are able to integrate your SCADA systems and machinery, regardless of how different they may be. Lantek is capable of integrating into the most diverse systems around, as a result of its REPLICA integration mechanisms. As a user, you obtain a joint operation of your existing systems with your Lantek solution in a seamless manner. Furthermore, you are able to integrate even your suppliers´ and/or customers´ systems. "Evaluate the various use cases and how they fit into your business." Contact your closest Lantek office and discover how many companies similar to yours already have a solution adjusted to their needs.